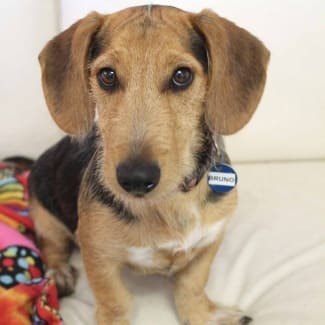 DoggieRescue.com has a No-Kill policy. We will house all dogs we rescue for as long as it takes to find them a loving and permanent home. DoggieRescue stands by their dogs for life. We take our Doggierescue.com dogs back at any stage, however there is no refund and we do not charge a surrender fee. All Doggie Rescue dogs are desexed, vaccinated and heartworm protected prior to adoption. They have also been vet-checked to confirm general good health. However, Doggie Rescue cannot guarantee the absence of any incubating illness such as kennel cough (a flu type illness common to dogs that have been in the pound environment, which is simply treated with antibiotics and a few days of bed rest) or any congenital health problems to which some breeds are prone. The cost of all veterinary treatment subsequent to the day of adoption must be borne by the new owners. We believe that dogs are happiest and most settled when they are integrated into the family. Many of the Doggie Rescue dogs haven't had the happiest of starts, and our policy is to re-home them in an environment where they will truly become a loved and participating member of the adopting family. For this reason, we look for adopting families where the dog will be allowed access to at least part of the house while family members are home, and where the dog is able to sleep indoors - at least in the laundry or internal garage. For people who intend to sleep the dog outside in a kennel or other outside bed, or who intend to keep the dog permanently outside, a Doggie Rescue dog is not for you. DoggieRescue.com does not engage in the purchase of dogs as gifts for others or as a surprise, without their direct involvement. It is most important that the whole family with any current dogs are present to make the selection of a DoggieRescue dog. Bruno is a super friendly happy pup. His tail does not stop wagging and he loves being around people and other dogs. He is super quick through doorways. He has a wiry coat and weighs 7.3kg. Suit Home Based Worker or Doggie Pal: Unable to cope alone and has shown signs of separation anxiety. Needs human company or other dog pals. Garden: Needs a home that has more space as well as a garden for exercise and regular walks outside. Fletcher is a gentle placid boy with a sweet nature once you get to know him. He can give a low growl when you pick him up but loves being cuddled. He is posessive of toys and kongs. He is social with other dogs. He has a long coat and weighs 5.0kg. Apartment Friendly: Could cope in an apartment environment. Regular walks or use of an artificial grass patch is suggested. Suit Home Based Worker or Doggie Pal: Unable to cope alone and has shown signs of separation anxiety. Needs human company or other dog pals. Adult Home: Nervous or not tolerant of children. And/or too high a level of excitability for children to control. NEEDS RESCUE EXPERIENCE: Many people grow up with, or own a dog who has had no bad experiences in life. A dog who is confident and well rounded. However, many rescue dogs have not been as lucky in their lives. Unfortunately, some rescue dogs have been physically abused, neglected and left traumatised. These dogs need someone with previous rescue experience in rehabilitating traumatised dogs with an in depth understanding of and experience in building relationships with these kinds of dogs. 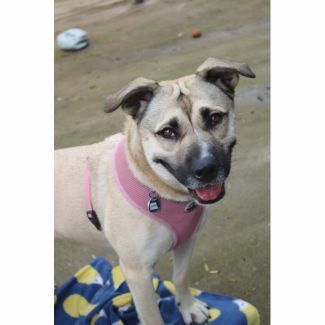 Pippa is sweet affectionate girl who is social with other dogs. She greets you with gentle gallop and nuzzles her face into your hands. She is such a gentle dog. It is hard to imagine Spitz X Staffy, as written on her chip. She is more the shape of a kelpie and has a short coat and weighs 17.8kg. Good with Kids: Shown to be good with kids in the controlled environment of the Shelter. Garden: Needs a home that has more space as well as a garden for exercise and regular walks outside. Suit Part Time Worker: Copes alone for short periods, with training possibly longer but presently does need someone home part of the time. Sam is a very nervous dog who is better with women than men. He’s shy to approach both human and dog. He walks with another doggy pal at a slow pace but is scared of passing dogs. He enjoys being patted by volunteers. 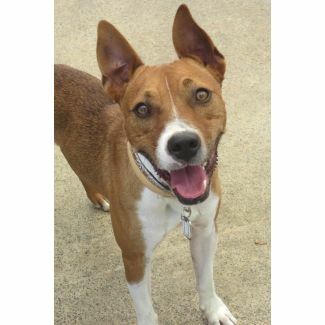 He needs a family with a lot of experience to improve confidence around people and dogs. He has a smooth coat and weighs 8-9 kg. Garden: Needs a home that has more space as well as a garden for exercise and regular walks outside. Suit Part Time Worker: Copes alone for short periods, with training possibly longer but presently does need someone home part of the time. NEEDS RESCUE EXPERIENCE: Many people grow up with, or own a dog who has had no bad experiences in life. A dog who is confident and well rounded. However, many rescue dogs have not been as lucky in their lives. Unfortunately, some rescue dogs have been physically abused, neglected and left traumatised. 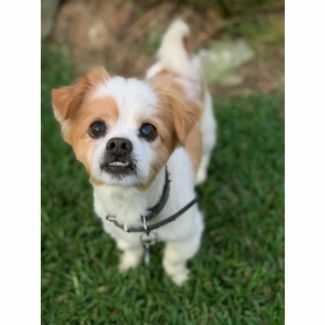 These dogs need someone with previous rescue experience in rehabilitating traumatised dogs with an in depth understanding of and experience in building relationships with these kinds of dogs. Pinky is a very docile, gentle and well behaved rabbit. She is happy to be picked up and loves being patted and enjoys being around people. 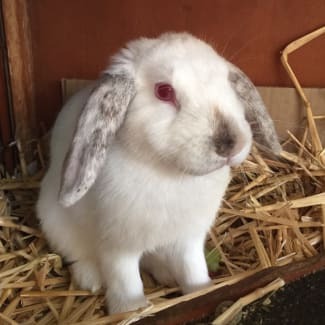 She is a lilac point short coat mini lop with ruby eyes and weighs around 1.5kg. She is a young adult. She is vaccinated.